This script will create a new document library in SharePoint Online using where we will using a list template from part 6. We will first start by opening the SharePoint Online Management Shell as administrator which can be downloaded at https://www.microsoft.com/en-us/download/details.aspx?id=35588. You can find more properties for the ListCreationInformation class at https://msdn.microsoft.com/EN-US/library/office/microsoft.sharepoint.client.listcreationinformation_members.aspx. $lci.url = $listURL below $lci = New-Object Microsoft…. I would like to create multiple document libraries, each with a different names, could You modify your script? Thank You for help and sorry for my english. Dus you leave the <> for the csv location? You will need to replica the whole thing with <> for the csv location. Sorry, I do not know why this line (csv) above is pasted wrong here – probably after execute script I try to change something in this line…and pasted here with wrong changes. When I ran the basic script, without creating csv – everything works well. I see that this line change here automaticaly always shorten after I click Post Comment. Man you shared most common and most demanded work via powershell. Loving your work! I think this script can save me so much time, especially with the import CSV option. Can you indicate how to adjust the script to use a Library Template? 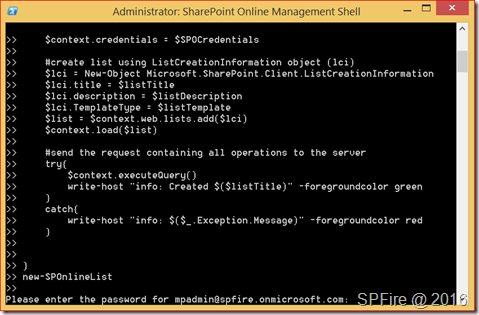 It is possible to get the custom list templates by changing the code from http://www.sharepointfire.com/2016/01/get-sharepoint-online-list-templates-powershell/ . It is unfortunately not yet possible to create a list based on this custom template. You will just get a normal list using the featureID and the ListTemplate from the custom template. If the template is not that complex you can for example add content types, change views etc using other CSOM commands after the list has been created. Great script – is there any way to create sub folders within the document library once the document library has been created? Please can you confirm whether or not it is possible to run this script whilst using the csv line above but to create each library based on a template? I thought it wasn’t possible to use ListCreationInformation with a custom template. You can create a default list and edit this to you needs by using PowerShell but this will take a bit of code. Thank you! This is quite helpful!